Vic Gundotra was the guy who hired me at Microsoft and today is in charge of Google’s social strategy. He’s one of the “post reorg” guys who were hand picked by Larry Page. Also announced last week is that Larry Page is tying Google’s bonus structure to how well they do in social. Turns out that Google has a lot of Facebook envy. In yesterday’s Gillmor Gang I argue that Google and Facebook have completely different cultures. Google is very much about finding information while Facebook is all about helping people “waste time.” Think about why Zynga, a company that helps us “waste time” playing games built on top of Facebook’s culture instead of Google’s. These cultures are like oil and vinegar and if you force one to be another it could turn bad. I say that Google should play to its strength when it comes to social. But today I want to give Googler’s some more specific advice about what that means. Yesterday I visited Harley Farms. They raise goats and make the best goat cheese in the area. 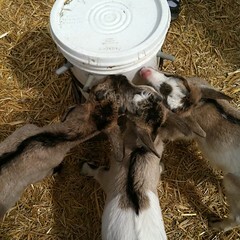 The baby goats are SSSOOO cute! But, let’s stay on track here. While I was picking up some cheese for today’s lunch with my parents (my dad is recovering from a kidney transplant, quite well, thank you very much) I watched two girls pull out their iPhones. One used Red Laser to scan a book in the store. Another checked in with Foursquare. I realized just what they were doing: wasting time more efficiently! Google doesn’t get this new behavior. Google’s engineering culture doesn’t quite grok why people would waste time. Why they would update their Facebook profiles for hours every week. Or, even, set “relationship status.” Yeah, they might copy Mark Zuckerberg and put some of those features into whatever social system they will reveal at Google IO, but I don’t think the culture really gets why those things work. They help us waste time more effectively. See, wasting time is big business. When I want to REALLY waste time I watch TV. But along came IntoNow, an iPhone app for telling other people what you’re watching (among other things). Yesterday, while using it I saw that Techcrunch writer MG Siegler was watching the Masters. Along with a bunch of other geeks. Hey, time wasters! But, they were wasting time more effectively than I was (I was attempting to be more “Googley” and was attempting to be more productive by being on the Gillmor Gang). I quickly felt that social network FOMO (Fear Of Missing Out) that the New York Times wrote about this morning. How else is the new tech world helping me waste time? Foodspotting helps me get hungry and helps me find better restaurants in which to waste my time. You can follow my time-wasting meals there (latest photo is from Friday afternoon when former Zagat mobile guru Ryan Charles and I wasted time together eating cheese and talking about 3D cameras and his new company — more on that soon). Foursquare suggests places where my friends are wasting their time (you can see some of the places I’ve wasted time at here). I might join them at, say, the Ritz’ bar if I see one of them check in there. When I go shopping (the ultimate time waster because it costs money too!) I use ShopKick to get deals whenever I walk into a store. * Show me sushi restaurants around me where my friends are wasting time. * Show me TV shows that my friends are wasting time watching. * Bring me games that my friends are wasting time playing. * Take me on trips where my friends are wasting time. * Show me products my friends are wasting time buying and using. * Tell me the best coffee that my friends are wasting time with. * Take me to the blog that my friends are wasting their time reading right now. * Say whether my friends are mostly using iOS or Android devices to waste time. * For those of my friends who are wasting time watching movies right now, which ones are they watching? * For those of my friends who like Cricket, which teams are they wasting time cheering on? Can I do any of this on Google now? No. Why? Because wasting time is big business. We spend billions, if not trillions, wasting time. Just ask the travel industry. Or the gaming industry. Or the movie industry. Or the music industry. Or the skiing industry. And we want to waste time more productively. This is where Google should play to its strength. They have the infrastructure to connect us to friends who want to help us waste time better. They still have a few people who will code it up. They still understand the web and mobile than most any other company. They still have those funny cars going around making cool maps (except in Germany). Google’s bonus should be based on how well its services have helped me waste my time more productively. So far Google plays a very small role in helping me waste time, when compared to these newer “social” services (and more are coming over the next month). Why doesn’t Google start grabbing up services that help us waste time? Why, Vic, don’t you start building partnerships with anyone who has information about how we are wasting time? Why not become the ultimate place for us to look for new ways to waste time? I want to try some new wine next weekend, for instance. I would never go to Google for finding a bottle of wine. My time wasting endeavors are too important to leave to some cold algorithm, after all. So, I think I’ll go ask Gary Vaynerchuk. Why don’t you buy his wine store AND him? Make him the ultimate authority on wasting time more productively? Speaking of which, did you just see what I did there? I linked to Twitter. That’s a great place to waste time. Why don’t you buy Twitter and save them from their monetization misery? Make Twitter the hub of time wasters everywhere! Add onto that purchase Quora, which is turning into a pretty good place to find places/events/experiences to waste time with. Here’s its answer on how to waste time most productively while visiting Napa, for instance. Why don’t you hire David Schmidt, who just built a cool map for Foursquare, and have him create all sorts of maps like this using various services that will help us share how we’re wasting time? Which will help us all become more productive at wasting time (better yet, why can’t you show us where all the BBQ-loving people are checking in near us? Oh, yeah, I forgot, Google is all about NOT wasting time, which is why you haven’t yet gotten social). Anyway, we’ll see you after Google IO and I’ll judge whether you should get your bonus based on whether your social services better help me waste time. So far you aren’t doing very well. I’ve even wasted my time adding hundreds of +1’s into Google, but does that help anyone waste their time more productively? Not with such an unattractive list, that’s for sure! David Schmidt has done more for my time wasting than you have so far and that’s VERY sad. So, Vic, here’s your bonus. Help us waste time more productively and maybe this bonus will turn into some very real cash from your boss. Not “waste time” but rather helping people get a portion of the oxytocin-laden feeling they have when they meet in real life, but this time transposed in the virtual. This, with narcissism, is what makes FB so addictive. Agreed. I just wrote about how social is all about ME…and that’s what Google doesn’t seem to get. I think they do. They run a site called Youtube -Broadcast yourself. It doesn’t take a psychologist to know the appeal is a combination of narcissism and voyeurism. But the world doesn’t need another facebook, and it isn’t exactly easy to come up with another product concept which is as addictive. I liked your analysis, Mike, especially the possibility that some don’t even see the value in building social features in their products. farmville offers no oxytocin, I do it simply to waste time. What is it going to take to wake up Goog? are they going to wait till FB introduces a direct Adsense competitor? i am sure with the social graph, FB is well positioned to go in that direction. I hope they come up with something real soon..and no more alpha, beta…products. You are not a startup anymore. Speaking of FOMO, I think that’s what Google has. They see Facebook, Twitter, etc. growing like crazy, and they feel like they need to get themselves some of that, even though it isn’t clear how that relates to what they already do. It does relate, sort of, but it has a rather different mentality, as this post is pointing out. I totally disagree. Why? Because it helps me find better food on my next trip and helps me see eating patterns which are negative (if I want to change). Plus, it’s a game and it helps me more efficiently waste time. Once you start using Foodspotting you realize it’s far better than Yelp or Google at finding interesting things to eat. Does it matter what your friends are eating or generally what people like you are eating? In your things you like to do to waste time list, you mentioned ShopKick which gives you deals, but doesn’t seem entinerly social. Yet, for things that you recommend google should do, you focused entirely on what your friends are doing. It feels like there is room for utilizing (and influencing) one’s Interest graph rather than always staying within your sphere of Friends. Having time to waste is a luxury but I am not sure I want to be influenced by my friends experiences in a futile effort to increase my efficiency in time-wasting – it’s my time, after all. Take this to its extreme and we will all jump from one fad/hip/product/place-to-be-seen as we over-zealously try to judge the gestalt (and the advertisers desperately try to flip our channel). In such a universe, there will be a few leaders (who will fall in and out of favor) and many followers. That pretty much describes the current social on-line scene. Are we that insecure/open to suggestion that we no longer want to find our own path? Perhaps Google can be the anti-social – the official “chart your own course” company. They lived that vision vicariously through the Superbowl Xoom advert. Although I once used Facebook and dabble in Twitter, I am not really interested in “wasting time.” Acknowledging the wry humor in this post, a few weeks ago I said to a friend-not a Facebook “FRIEND” by the way, but one in corporal form-that posting updates often reminded me of a passage in Conrad’s Heart of Darkness where the protagonist encounters a French warship lobbing explosive rounds deep into the African interior; so deep that there was no visible sign of their impact. Too many of these tweets and updates seemed similarly futile, lost somewhere in the void with no perceptible impact. Mr. Scoble, you wrote an entire article on the premise that Google does not know how to help people waste time. Then you go on to negate the premise by conceding to add a small footnote that Google actually knows how to help people waste time using YouTube. Why not pull the article instead once you realized that the whole foundation was wrong? It’s NOT wrong. Most of Google is NOT YouTube and even YouTube could be much better at helping us waste time (longer videos, live videos, much better identity on comments to get rid of all the bad ones, etc). YouTube’s headquarters are separate from Google’s headquarters. Culturally they are quite different companies. In fact, YouTube is one of the only Google acquisitions that didn’t burp out their founders almost immediately. The fact that you think that YouTube isn’t the exception to the rule demonstrates that YOU don’t get Google’s culture and haven’t studied it very closely. they do get it. whether they’re as enthusiastic about helping people wast time as they’re about saving time is another matter. In one of his speech, Eric Schmidt said something like “providing you more ways to waste time” then, he realised the negative connotation, and wryly said wasting time is human race’s favourite pass time. I think they do get the fundamental appeal of social, but they deep down has certain disdain for it. Scoble do you have more pictures of baby goats? Appreciate if you’d share, goat kids are super adorable. Rob I think you are right on Google. In fact what you suggest Google give me tools how to waste time like what my friends are wasting time watching is one of the few strategies Google has to implement. It is a must for next fight in social networks. And its just one of the things that will come handy to Google to fight Facebook. But then there are some things which I call “Users data generated for User” – Not my friends data but my own data generated and presented to me in such a way that i like to see it. This is something I think will be sticking point for any “social network”. For example I am a believer twitter is very much like MySpace right now before Facebook. It is huge because of viral effect. But there is no sticking point. Facebook came up with a better interface and design and my social graph moved on and so did I. Twitter I feel there is no sticking point. Its just waiting for another and better twitter to come and take its position. My own data would prevent me from hopping from one site to another as i would not want to build up new data again and again. So it will pull back my social graph from moving. Google if implements something along those lines would be able to check in Facebook’s growth. But If Facebook implements that, it will be even more difficult for Google to kill it. Also talking about Google’s culture, I have always felt Google has a very arrogant attitude towards the users and think whatever they think is right. Like Buzz, they created so much of privacy issue that users didn’t stick on. Facebook privacy issue has been a problem but it wasn’t adding people to friends list on its own. Plus i can email a million people but they are not my friends so importing that was horrible. Then there was Gmail folder and label thing. They eventually got folder but initially it was only label. Also Ive heard lot of horrible stories around hiring product guys at Google for whom the founders have little respect which makes everyone in charge very technical and thus everyone thinking on same plane. Also, Google should have offered Zynga lot of money when there were difference between Facebook and Zynga last year. Zynga still being there on Facebook makes Zynga stronger but it makes strong Facebook more like invincible. – Strategies like +1 should be launched along with other social strategies else if there is a viral effect with something like this dies down by the time the next product is launched. The point is not all my “friends” are my Friends, and if Google (or any other SSN [social search network]) is going to get social + search right, this kind of search filter needs to be accounted for. By the way, I’d LOVE to be able to separate my friends into two groups: those who love sushi and BBQ and those who don’t. Even further then, I’d like to give extra powers to those who know how to recognize what great sushi and BBQ are. Those are the folks I’d trust. This is why Facebook is getting ever more useless with each passing day. You can’t group friends based on “context”. The deepest you can go is “Friends only” when you post something, and that post goes to everyone else in your network, even though you only want 5% of them to see that specific post. Since they don’t have that, Facebook is becoming increasingly more “spammy”. The problem is, Google’s guide would depend on algorithms (engineers over there have to do something), and then someone sitting in Bangalore would figure out how to be at the top of the guide for every piece of food ever spotted in humankind, and then some1 in western europe would write a program to hedge it at 2% margin. There is a reason Zagat & Lonely Planet command top dollars for the traffic they route. BTW: To go back in time, pick up the latest news of Google. Replace (a) “Social” with “Search” (b) Facebook with Google (c) Google with Microsoft. Keep the reorg and billion dollars intact and we are reading the Gates memo on competing in search. Damn! This post can embarrass the reader. Fortunately I am active only on Twitter. But yes, a clichéd yet rational argument. Society’s intelligence and intellect is ballparking because this technology is making us more primitive and handicapped. Amazing post nevertheless. I could well be wrong, but Google is increasingly looking like the new Sun Microsystems to me. Google relates information to a users search requests but what it has missed out on is providing details of the experience – which is where the other, nimbler sites come into their own. There is also the element of trust – we will take information from our friends etc more seriously than something that a search engine, no matter how sophisticated, provides us with. Good points, Scoble. I won’t take time to argue much as I usually do, except for one item. I don’t think the Gorg should bother to buy the Quorb. It would inevitably turn into a cheap Question/Answer on the order of Yahoo! Answers or the failed Gorg Knol. The Bora is even now (as I think you recall) a mishmash of one-third questions and two-thirds comments on whether the questions are valid questions or the answers are valid answers or should be comments or what is a valid answer or who is a valid moderator or what is the power of a moderator or (and on, and on…procedural gunk). For these sorts of things, folks can more easily and more productively “waste their time” commenting on forums and on articles like yours. No? Google’s bottom up approach to social can be catalyzed by a symbiotic relationship with a matching top down social-graph command center for the users convenience, clarity and overview. This would not interfere with the distributed social-graph elements that are presently integrated across Google product landscape. Users could continue to use either or both but they are mutually reinforcing. As Chairman Mao pointed out “a revolution is like kicking down a rotten door”. And there is no door more rotten than the present state of social-graph execution on the web today! We have an ocean of rotten forms and rotten functions. Atrociously over complex and under effective social-graph network geometries between participants and even more egregiously poor interface ergonomics. All these badly implemented social graph fads dancing around the mulberry bush in a desperate attempt to distill which social-graph functions are sticky enough and practical enough to be absorbed into the stream of daily mass culture as an enduring meme. This situation is ripe with opportunity. Distilling and simplifying the core social-graph functions that are ripe for mass-culture adoption is a must. This means clearing out the clutter with a reduced palette of core social-graph tools. This will be one of Googles key challenges as Google is very weak on the perceptual ergonomics necessary to produce a simply, visually clear, user experience. They already have a distributed array of embedded social-graph functions from which they can distill and simplify a core set of mass-culture social-graph tools for the rest of us. Mixing this with a top down control panel overview effectively polishes the apple(pun intended). User can then choose to turn social tools on/off within isolated Google products or to utilizes a centralized top down control panel view of their complete Google social-graph party. Google users can then have their embedded social components al carte or they can choose to eat them all together as a complete meal. This is cake and eat it to material! Google shouldn’t dally too long though. I am sure Apple is in the wings working away at distilling a core set of mass-market social-graph tools that are an easy to use, easy to look at, transparent commodity. OH WELL …. IN FOR A PENNY IN FOR A POUND! The social-graph functions which are sticky enough and practical enough to be absorbed into the stream of daily mass-culture as enduring memes come in two basic flavors. 1- TIME WASTING – gregarious/useful personal social exchanges = Facebook. 2- SOCIAL REALITY GLUE – cloud-crowd sourced social-data-visualization for the rest of us. It is this SOCIAL REALITY GLUE, this shared reality visualization stuff, that will define the true impact of social software on global culture. A focus on creating intuitive visualization tools that clearly elucidate social and political realities, all the way up the stack, from family power politics to international banking control would play to Google’s unique data message engineering strengths. Google could use these intuitive social-graph visualization tools as an anchor mechanism around which to construct a template driven neural-network of Facebook-like, purpose focused, social-stakeholder communities. Then build out template based assemblers that empower the rest of us to build, purpose focused, social-stakeholder visualization-communities. Add on a federated discovery system for identifying specific, purpose focused, social-stakeholder, visualization-communities. The next layer is an interconnection toolset that empowers these social-stakeholder visualization-communities to define the type of neural-network input/out(publish/subscribe) interconnection rules and filter-logic that are establish between communities in ways that serve their community’s best interests. Both the internal dynamics of each social-stakeholder community and the global dynamics of interconnecting all these communities represents our inescapable challenge to transition form the old linear top down social control model to an organically distributed social control model. Building out this organically distributed social control is our inescapable fate. A fate driven by the self-selecting, self-reenforcing, teleological strange-attractor that drives all self organizing complex systems. RESISTANCE IS FUTILE! We are the Borg, we and only we are responsible for deciding how to assimilate ourselves. So if you want a real challenge, there you go Larry! This challenge is bigger than the self driving car. It has synergism with Google’s social goals. It plays to Google’s engineering strengths. It differentiates Google’s SOCIAL-REALITY from Facebook’s SOCIAL-PLAYGROUND. I just tried Chewsy based on your recommendation. There isn’t a single review for Half Moon Bay. Totally not being used and TOTALLY not even close to as interesting as Foodspotting, sorry. Foodspotting isn’t about reviews, it’s about taking pictures of what you’re eating and sharing those. I find so much great food by watching those photos and interacting with the folks who took them. Robert, I know you’re a big foodspotting fan. I used to be a very active foodspotter and just became a new chewsy user recently. Every startup has to start somewhere especially when it’s crowd sourced. At the beginning, Foodspotting had very few photos and you’re just coming on now after they’ve had over a year of being in market. For me, standing in the middle of SF, I’m seeing hundreds of reviews for food in chewsy. I traveled to NYC 2 months ago, and austin just after that. Same thing, great reviews there (although NYC seemed to have the most). so looks like there aren’t any users in half moon bay? Can’t criticize them for that, especially since they look like they are having success in various parts of the country. For me, foodspotting isn’t as interesting as seeing reviews. Foodspotting’s stated mission is “Share a food you recommend or see what others have recommended near you”. Sometimes it’s nice to know WHY someone liked something, not just a picture. Also great to know WHY someone did NOT like something. I’ve been on Foodspotting for almost a year now. Sorry, they had more photos even when I joined and more hype and better PR. When we compare services we can’t go back to when the competitors were 0 day. That doesn’t work, sorry, and I’m not going to let you slide it in here unchallenged. It’s like saying “oh, we have a very cool eBay competitor with more features.” Um no you don’t. If you don’t have users you don’t have more features. So, you’ve gotta convince me that it’s worthwhile. And so far I don’t see it. I’ll keep trying it though but it isn’t there today (and I looked at communities other than Half Moon Bay just to see if I’m smoking good dope. I’m not). I’m not a fan of Foodspotting, talk about a complete waste of time. Show me reviews of food not just pretty photos! You might miss that I travel a LOT (I’m going to Omaha right now, will check out the apps again there). Wasting time is part of it. I agree with earlier comments it’s more about narcissism, the time wasting activities have to be about ME, adding more feel-good value to my virtual persona. As best as I can tell, your definition of “wasting time” is so liberal as to include everything that isn’t work. I’m one of those people who tends to see work as the waste of time, done only to support more fulfilling activities like spending time with family and friends. But that’s besides the point. The problem here is that you’re not suggesting anything people at Google doesn’t already know. Google is about finding stuff. You’re saying Google should help you find what your friends are doing and what your friends like, or at least use that information in search results. There’s no question Google could help you “waste time” with social information at their disposal. But to offer that, Google needs to 1. Know who you are 2. Know who your friends are 3. Know your likes and their likes and interests and what they’re doing, etc. Googles dilemma is how to get people to share that kind of information with them, especially since they’re already doing it at Facebook and network effects and people won’t see a reason to join a new social network especially when no one they know is on it. Google has had products that attempt to do this. Some were successful at the time and just didn’t innovate fast enough (Blogger), others they just let whither (Jaiku, Dodgeball), others were DOA (Buzz). It’s that trend Google needs to change. The task for Google right now create something that will inspire me to share with them my activities and interests and likes, and for my friends to do the same, so we can search on each others interests and “waste time” as you put it. So far Google hasn’t shown itself up to that challenge. On another note, do you think that with so many new ways to waste time, people need a better way to focus and remember what needs to be done? I like the concept of killing time productively. Funny, my productivity apps at work look a lot like Facebook or Twitter (we’re trying to decide between Jive, Saleforce Chatter, or Yammer). Even there Google loses. And I disagree. If you’ve lived ANY life at all you know who on Facebook to ask about wine. Maybe it’s a boss, maybe a friend at church, etc. My guess is that Facebook plans to introduce Google-wave like features one step at a time until they have people surfin the power that should have been Google-Wave had Google the sense to introduce it slowly as stepwise incremental feature improvements to basic gmail rather than scare everyone off with the overwhelming and thus confusing mother-load of organically flexible social-graph construction kit features that were at the heart of google wave’s nooshere generating potential. In MHO, if the GOOGLE-WAVE-FEATURE-SET had been presented with a clean, simple interface, sporting perceptual ergonomics that were simple enough to penetrate the public mind-set as the dominant meme for common everyday usage when organizing and synchronizing social process/collaboration, it would have been a boomshell hit. WAVE was a monumental ZEITGEIST-FRAMEWORK for recombinant, reusable, social process literacy who’s only analogue is the power of recombinant organic cell structure bestowed upon the biosphere. Now that the under appreciated genius that is Lars Rasmussen has moved over to Facebook it is remotely possible that they could provide him the necessary resource to accomplish this promethean task of simplifying his vision into an interface that can be effectively injected into every day language and culture. Given that Facebook’s track record on interface design is arguably even worse than the train wreck that is Google-interface-design this seem very unlikely. Lars Rasmussen should have gone directly to Apple for the interface chops to implement his vision. As it is, Apple is probably busy distilling the core elements of just such a social-organizing-meme tools-set that is easily accessible to the rest of us on an assortment of Apple branded gadgets. We went to a play downtown and wanted to try something new for dinner. We searched for restaurants on local Bing and Google. We gave up and ended up parking near a few restaurants and got out and walked around. Walked up to one, saw the menu, prices, ambience, waitlist and made our decision with iphone securely pocket. Had the time of our lives, laughed, ate, conversed with others verbally and left happy. Is there an app to replace that? Excellent! Foodspotting might have shown you the better meal that was right around the corner. Yelp might have shown you that the place you ended up in actually had roaches found in the restaurant last week or that there is a much better reviewed place around the corner. Foursquare would have shown you tips, like the one I got in a restaurant in Atlanta “try the fried bacon,” the tip said. It was right. My experience was even better. The thing is, you don’t know what you’re missing. Ignorance is bliss.